Powering millions of websites WordPress built a strong community of passionate followers and geeks who constantly improve WP experience by releasing various plugins which bring different functionality to websites. Today we will take a closer look at the plugins helping us to deliver top quality customer support services and offer our users the ultimate customer experience. Reinforcing your website with such plugins will not only improve your customers experience but will also add credibility and human touch. According to recent trends and surveys Live Chat popularity has been growing dramatically and by equipping your website with this tool, you will satisfy most demanding users and will keep up with the latest trends. Moreover, besides chatting feature Live Chat will give you other out-of-the-box benefits like real time monitoring, ability to track sources your visitors come to your website from, building traffic stats reports and much more. Live Chat tool is also available for free testing with full functionality coming with it, so you will have a chance to test everything out, customize and set up and running on your website. Staying in touch with your customers and keeping them informed about your promotions, special events, new offering etc is an important part of efficient customer service and email marketing campaign. Your existing customers will feel they are taken care of and will return to your website for future purchases if you keep them informed about your promos and offerings. 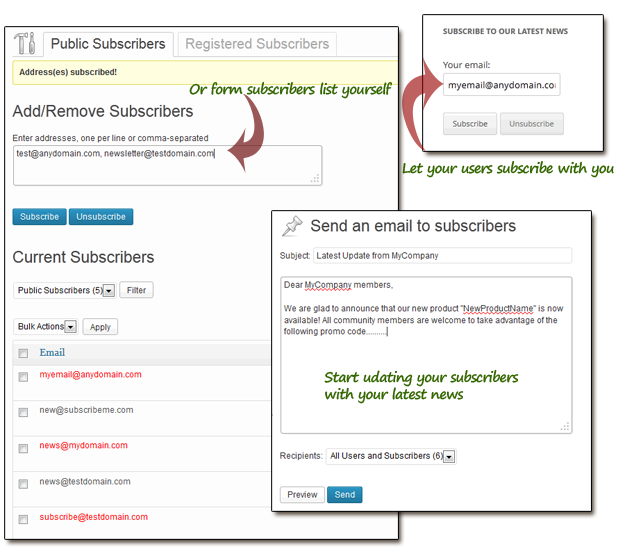 Subscribe2 WordPress plugin will let you not only automatically send email updates, but will also help to build a unique database of your subscribers and maintain it directly from your WordPress Control Panel. For blog owners it’s a great opportunity to let subscribers virtually know about all new posts and pages being posted to your website. Just do not miss a chance to spread the word about your new products, updates or news. Inquiring about most useful products and services is another step toward improving customer satisfaction and developing a better strategy. Your community will be glad to help with your future strategy, just encourage them to vote on custom polls and express their opinion. 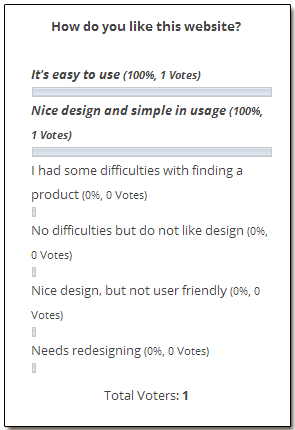 WP-poll plugin lets you design your custom CSS polls or use ready-made templates, it will seamlessly blend with your website encouraging your users to vote and letting them feel more valued. In addition it will require just a couple of clicks from your side and minimum efforts to have a polling system integrated with your WP site. Moreover, you can set the limit for votes from one user, see at a glance how many users have voted on a poll, track repeated votes to get most accurate results along with other useful customizations and reporting options. Try out using these plugins on your website to see how they improve your customer satisfaction rates. You can check how Live Chat works and experience it in action in this blog, just click the Live Chat button in the top right corner! This entry was posted in Articles and tagged best word press customer support plugins, customer support plugins, wordpress live chat plugin, WordPress plugins, wordpress plugins for customer experience, WordPress plugins for excellent UX, WordPress user experience plugins. Bookmark the permalink. Great post! Keep the plugin options coming! Your G+ link appears to be broken. Thank you, Liz. We have different types of integration options for CMS and shopping cart systems, this is the link to the whole list.